January 1st-3rd my wife kids in I were in Los Angeles to see the sights, including the Tournament of Roses (the Rose Parade) in Pasadena Monday January 2nd. Afterwards we hung out in Pasadena a bit, and then headed south to see Space Shuttle Endeavour at the California Science Center, next to USC. Endeavour is one of four US now retired Space Shuttles. The others are the Atlantis at the Kennedy Space Center in Florida, the Enterprise in New York City, and the Discovery Washington, DC. 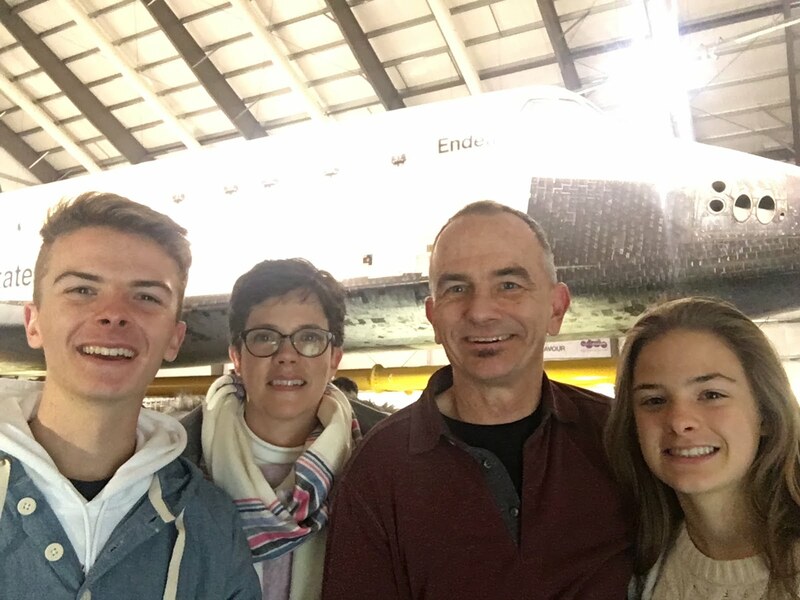 If you're in Los Angeles, Endeavour is really worth seeing. And the cost is only $2. Perhaps the best deal in town. The Endeavour is located in a large temporary building. Getting it there was an amazing feat. Plans call for a much larger permanent display building, allowing the Shuttle to stand upright. Even it's temporary home, it's an incredible sight. But with the average camera, or iPhone, how do you actually get a photo of the entire shuttle? Unless you have a camera with a wide angle lens, you'll cut off either the nose, or the tail, or both. You could try to stand in the corner when you walk in. Fail. The poorly placed sign in the lower right at the entrance makes that impossible. Of course, many thanks to donor Samuel Oschin for his sponsorship of this project. Everyone just wishes the sign was placed elsewhere. So, how do you get a photo of the entire Shuttle? If you walk over to gift shop area, try standing at the far wall and shoot over the racks of clothing and display. Voila. You'll have a photo of the entire Shuttle, nose, tail, and all. 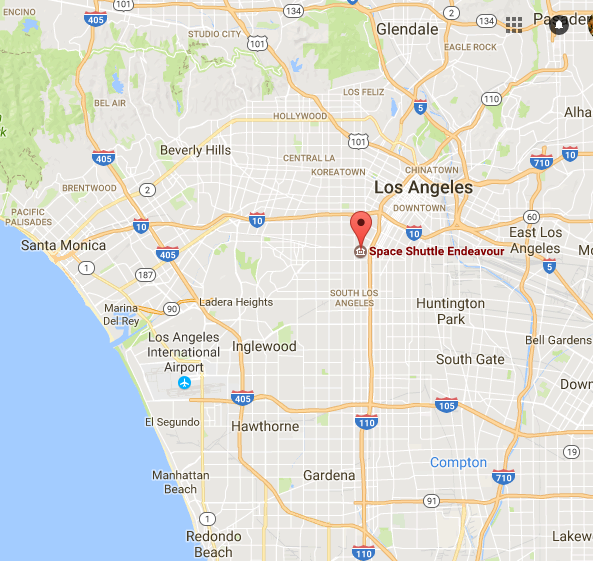 The Space Shuttle Endeavour is located at the California Science Center, just southwest of downtown Los Angeles. Reservations are required on weekends and holidays. Here's a link with more information. While the Shuttle is great, there's more, much more, to see at the Science Center, including the undersea exhibit. The Garibaldi is the official marine state fish of California. When we home schooled our kids in Los Angeles, I was hoping we could choose the Garibaldi as our school mascot. My kids wanted the pelican. So ... we ended up with no mascot. Love seeing Garibaldi in a recreation of it's natural habitat. If you want to see the real deal, try either Catalina Island, or La Jolla (just north of San Diego). When I was there, a parent kept referring to the Garibaldi as "Nemo". Sorry, Nemo was a tropical (and much smaller) Clown Fish. But I just kept my mouth shut. The California Science Center is fantastic. So much to see and experience. While the Space Shuttle Exhibit was a small $2 charge - the rest of the museum is FREE. Of course, donations are welcome at the entrance - but a museum of this calibre works hard to raise millions of dollars in private donations and corporate sponsorship to keep the California Science free to the general public. If was a holiday weekend, so - of courses - it was crowded. But it was great seeing so many families and kids out having a great time, and, yes, learning things. Parking is available in the adjacent lot. $12 for the day. Or, if you're only going to be there for a couple hours, you might find meters on the street. I went the discount route, and found free parking a couple blocks away. The Science Center is also adjacent to the Expo Light Rail - which goes from downtown Los Angeles to Santa Monica. Here's a link to when my wife, kids and I took the Expo line here. We left around 4:30pm, driving past downtown Los Angeles, and north to Glendale. Pictured above is the Felix Chevrolet dealership just north of the Science Center. Felix Chevrolet has been around since 1921. Wow! Coming up on 100 years! . Their famous sign is sixty years old, and was declared a historic-cultural monument back in 2007. Good memories as a kid growing in Los Angeles. Whene we saw that sign, we knew were were getting close to the museum. 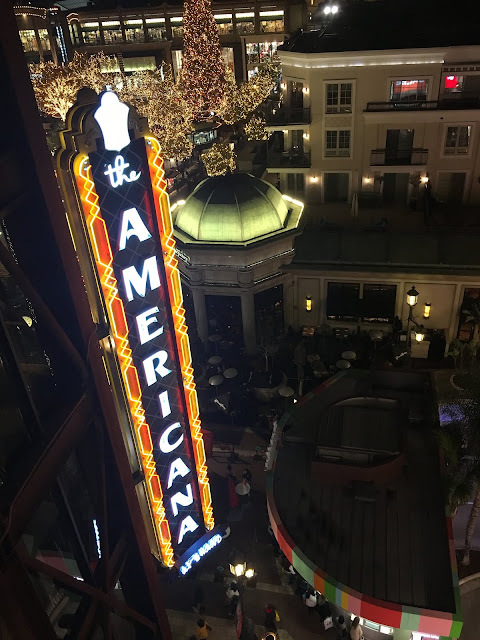 Next stop: Americana at Brand in Glendale. Americana at Brand is a massive outdoor shopping/entertainment/residential center, located on Brand Blvd in Glendale. Here's a link to a visit when our kids were much younger. 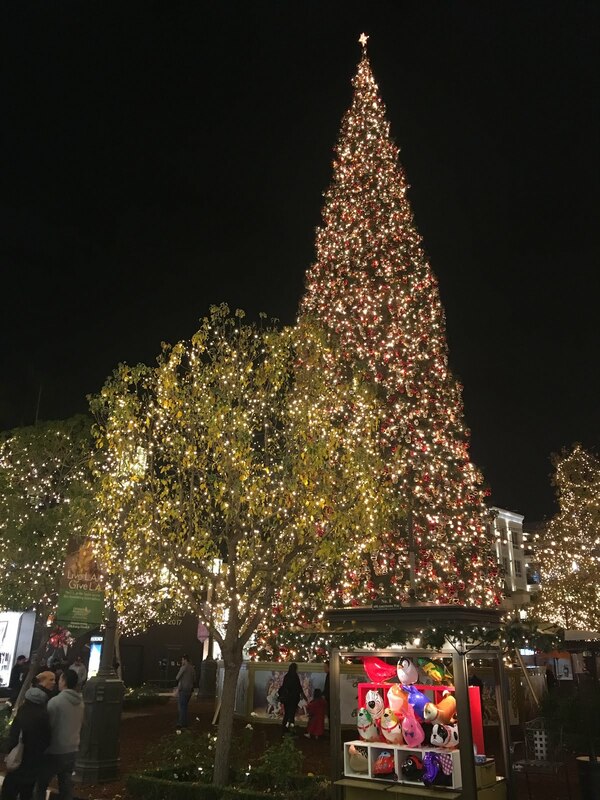 With a MASSIVE outdoor Christmas Tree, it was all decked out of the Holiday Season. Christmas is a unique holiday, at least in the United States, in that it's both a religious and a secular holiday. In the US, it's also a national holiday. Of course, there's a time and place to refer to the entire season as "the Holidays" --- referring to Hanukkah, Christmas, New Year, and everything else. I do, however, cringe when people refer to either Hanukkah or Christmas as "Holiday" (as in "have a great Holiday"). Christmas is a national holiday, and is the US's biggest and most popular holiday. No one wants to exclude or offend anyone, but I'm curious why Christmas - and to a lesser extent Hanukkah - have become "holidays that must not be named" (to paraphrase Harry Potter). So (belated, or perhaps now early) Happy Hanukkah, Merry Christmas, and Happy New Year. My inlaws suggested Din Tai Fung, a Twaiwanese restaurant with locations in several major cities around the world. In 1993, the New York Times referred to it as "one of the top 10 gourmet restaurants in the world." When we got there at 6pm - it was PACKED, with a 90 minute wait. Fortunately, our kids were old enough to hold off for an hour and a half, and we just walked around Americana at Brand. When we showed up at 7:30pm, the wait was three hours. And people were putting their names on the wait list, meaning they'd be getting seated for dinner at 10:30pm. Sure, why not. 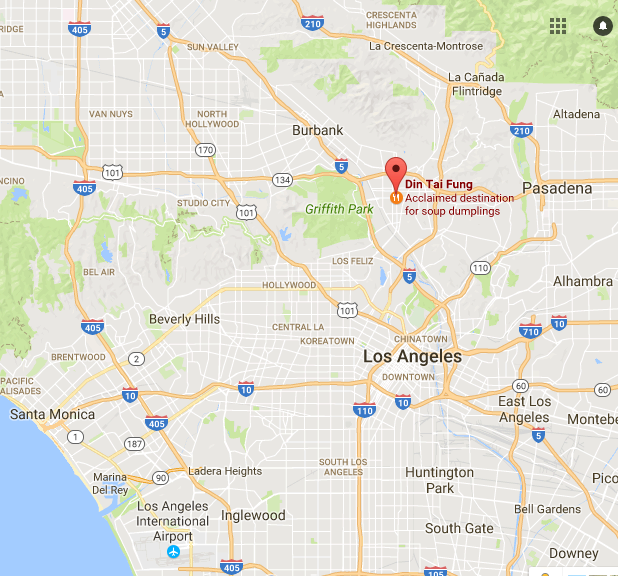 Location of Din Tai Fung, at Americana at Brand in Glendale. Outstanding food - yes, worth the wait. Based on the crowds of a holiday weekend, we probably should have planned to get there before 5pm. Oh well. Not sure what the wait is on an off night. Here's a link to their website. We drove back to our hotel in Woodland Hills for our big big day at Universal Studios the next day. More next time.